Hello friends! Today i would like to share with you the convenience of having internet and data connection with us today. Just like other girls, we sometimes need our pampering time and it is hard to actually make a reservation by calling as sometimes the line might get busy or they just dont pick up. Worry not! Now we have Bfab website to help you on the process of booking and securing your quality time. Bfab is a one-stop platform for all beauty & wellness services. We curate the best salon and spa treatments for you to discover and book conveniently. No more lost-in-translation-awkward calls with the receptionist to book a haircut, manicure or even a massage after a long day at work. When you don’t know where to go for a fantastic beauty or wellness treatment that will fit your budget, Bfab is the answer! which i think is kinda true! I think Bfab is a very simple portal / website to use for a very busy person like me. Their website is even looking good through mobile screen as well! Once you entered Bfab website, you can see this beautifully made home page where you can instantly book your type of services and also you can log in or join the Bfab community as well. So i choose to book a spa session this time around so lets see how smooth this website is. It is going to be my second time using it so we shall see together. In the drop box filter, i choose Spa as my booking services, Melawati as the address near me and i would like to book for tomorrow, which is on the 6th February 2016. I click FIND button next. Notice that i did not Sign In or Join in as yet and you still can search for the services. Once it finds the services that i wanted, i can also play around with the filters on the side of the website. You can change the date, the time and also the location. you can also try to filter based on the treatment type and also the price! You can also click on the Show On Map to make it easier for you to choose. Once i have managed to find which Spa i would like to book, i click on it and this page comes in. You can see few information on the page like it's address, opening hours from Monday to Sunday and it services based on body parts like hair, facial. spa etc anddd its prices and packages as well! Super easy to view and to made booking! The list of the services are based on the spa/beauty saloon availability of services. You can click on the little arrow on the end of each boxes and it'll show the type of packages and its prices as well. Here, i am choosing SPA and CreamBath - Normal. The duration of the bath would be 60 mins and the price is RM50. to make a booking, you can click on the price. Once you clicked on the price, a pops up comes out and you can choose the timing of your visit. Convenience! Then now you add in your details (and register instantly as well if you haven't) for them to book your time slot for the spa. What's best is that it depends on the shop, you can pay it at the venue or some may propose a Paypal way of payment as well. At Bfab you can have all of the greatness below! Yes. It is free of charge online booking. No money required at all! So, if you want to do an Online booking for beauty treatments in Malaysia you are welcome to try out Bfab website today. Best part is, there's a discount if you read more below! 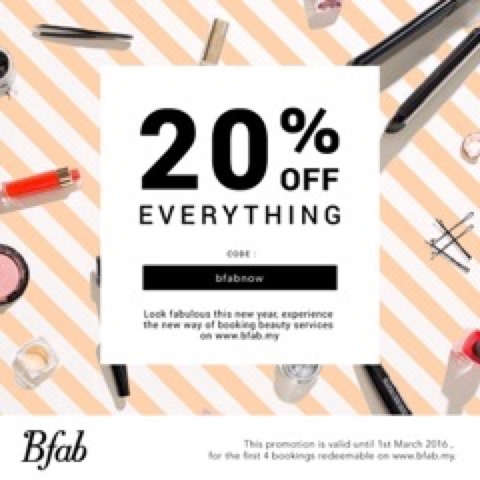 "Bfab launch promo - Use the code “BFABNOW” at www.bfab.my and get 20% off EVERYTHING on Bfab till 29 February 2016. Visit Bfab today to make your first booking with the voucher available above!